12" X 9' Putting green made from polyporpylene grass to simulate Bermuda grass to give you an authentic feel of speed, line and slope. Ball returns automatically from the back and side by gutters that track and direct the ball back to the putter after every shot. Completely portable, no batteries or electricity needed. Comes with Mini Tool Box. Great for storing any miscellaneous items or your spare change. Overall dimensions: 4 1/2" x 2 1/2" x 2 3/4". Mini Tool Box is shipped from a separate warehouse and will arrive within a few days of your order. 12" X 9' Putting green made from polyporpylene grass to simulate Bermuda grass to give you an authentic feel of speed, line and slope. 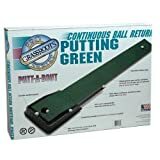 Ball returns automatically from the back and side by gutters that track and direct the ball back to the putter after every shot. Completely portable, no batteries or electricity needed.